Last night we told you about the 29 million US Dollar loan that the CDB had approved for roadwork's in Belize. But the release wasn't quite clear about what roads would be repaired. Well, we spoke with the CEO in the Ministry of Works Errol Gentle and he told us that the money will be used to upgrade the Northern Highway from the Burrell Boom junction to the first roundabout entering Belize City. He says the upgrade will include a new bridge to replace the Haulover Bridge. That's right, the decades old Haulover will be replaced by a new two lane bridge. But the old Haulover will be rehabilitated before it is removed, while the new one is being built beside it. The CEO says it can may be moved and used somewhere else after the new one is opened. The loan was just approved, the feasibility study and design is completed, and now procurement notices will be published. With that, work should start by the end of the year or early 2015. 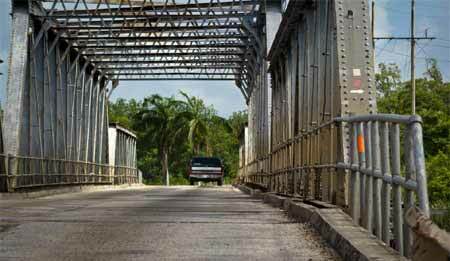 The directors of the Caribbean Development Bank (CDB) have approved a loan of US$29.719 million to the government of Belize that will allow for the rehabilitation of a major highway and the replacement of the Haulover Bridge. The loan will fund upgrade of 9.81 km of the Philip S. W. Goldson Highway, one of three main arterial roads in the country’s road network. This upgrade is expected to reduce congestion as well as improve safety on the highway, which passes through the Orange Walk and Corozal Districts. This area is of increasing importance for tourism and trade. 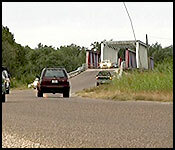 The historic Haulover Bridge is a major thoroughfare providing the only access to and from Belize City, and from the airport. A key aspect of the project will be the implementation of climate adaptation features during the upgrade and rehabilitation phases in order to reduce climate change vulnerability of the road and bridge. Funds from the loan will also be used to enhance the capacity of the ministry of works and transport to plan and sustainably fund road maintenance. US$111,000 of the loan will be used to assist in financing consultancy services for gender capacity building within the ministry of works and transport and Belizean contractors to address gender equality and social inclusion in current and future construction projects. The House of Representatives today approved a $29.7 million loan from the Caribbean Development Bank (CDB) for a new bridge at Haulover, five miles out of Belize City, as well as a major upgrade to the Philip Goldson Highway from Belize City to the Philip Goldson International Airport in Ladyville. In presenting the loan motion to Parliament, Minister of Finance, Prime Minister Dean Barrow, said that the loan would include climate adaptation works. The loan repayment schedule is complex, since it would be released in multiple tranches which carry varying interest rates, as well as different repayment schedules. The funds should be fully disbursed by the end of 2018. The portion for $13,740,000 should be repaid in 48 quarterly installments, after a 3-year grace period, at a rate of 3.59% per annum. There is a 1% per annum commitment fee on the unwithdrawn portion of loan. The $12,500,000 tranche would also be repaid with 48 quarterly installments after a 3-year grace period at 2.38% with the 1% commitment fee. Finally, special funds totaling $3,479,000 would be repaid with 80 quarterly installments after a 5-year grace period at 2.5% per annum. Opposition Leader Francis Fonseca said that while there is no denying the Haulover Creek Bridge is badly in need of replacement, he wanted to place on the record once again the issue of equitable allocation of resources across the country. Fonseca said that $60 million will be spent in the Belize District on worthy projects, but in many rural communities, there is no water or electricity; the infrastructure is in a deplorable condition; health centers are falling apart; and children can’t go to school because buses don’t go into their communities due to poor road conditions. The Opposition Leader reiterated that there needs to be greater equity in the allocation of resources. His comments were endorsed by Toledo West area representative for the Opposition People’s United Party (PUP), Oscar Requeña, who said that constituencies in southern Belize are clamoring for Government to ensure that the resources are distributed in a more equitable manner. Requeña said that he received a call out of San Vicente just this morning to say that the bus cannot transport people from the village because the roads are so bad. He said that the situation is the same in the villages of Dolores and Crique Sarco. “Please man, give attention to these areas that have been abandoned for the last 7 years,” Requeña said. Dangriga area representative for the PUP, Ivan Ramos, spoke about the need for the Government to ensure quality. “$60 million is not a little bit of money, so we want to ensure… we want to insist and go on record [to say] that we demand quality work for the monies being expended,” Ramos said. After this loan motion was discussed, Barrow rose to detail a second loan motion: the Alba PetroCaribe motion, which was not passed in today’s sitting of Parliament to allow for a more extensive review. Barrow noted that back in September 2005, Belize and Venezuela entered into a bilateral energy cooperation agreement, in line with the regional PetroCaribe initiative, under which that country would export crude oil, refined products and LPG (up to 4,000 barrels per day on an annual basis) to Belize. He explained that Petroleos de Venezuela S.A. (PEDEVESA) supplies the products, subject to certain terms and conditions, via a joint venture agreement between the two states. Belize repays 50% of the cost on a 90-day cash basis and the other 50% is financed over 25 years, under a program that allows the country to use the retained proceeds for initiatives such as social projects. Barrow said that since 2012, the financed portion, which will be repaid at 1%, has amounted to US$114,307,356. Section 7.2 of the Finance and Audit Reform Act requires a resolution of the National Assembly to authorize such borrowing, and so today’s loan motion was intended to fulfill that requirement. Barrow said that some media personnel and social activists have suggested that his administration has not been utterly transparent in its use of the PetroCaribe money, but stated that the charge is not true. According to Barrow, the details of the transactions are made public via the Government’s website, as well as the Central Bank of Belize’s website. He said that details are also published in the budget. According to Barrow, 70% of the retained proceeds are held with the Central Bank, propping up the country’s foreign reserves, while 29% is wholly uncommitted. That includes funds for the National Bank ($20 mil), municipal streets and roads ($37.5 mil), and social support and assistance ($9.4 million). He also indicated that the fund could also be used to help pay compensation to the former owners of Belize Telemedia Limited and Belize Electricity Limited, which have both been nationalized by the Government, although a final round of litigation is pending at the Caribbean Court of Justice over the constitutionality of the nationalizations. The PetroCaribe bill was sent to the relevant House Committee for wider review and refinement before its return to Parliament for second reading, debate and eventual passage.